The rocky little planet is likely devoid of atmosphere. NASA's Kepler space telescope has discovered the smallest planet yet found orbiting a star like our sun. Kepler-37b is so small, in fact, that it's just slightly larger than our moon. The largest planet in the system, Kepler-37d, is twice the size of Earth. 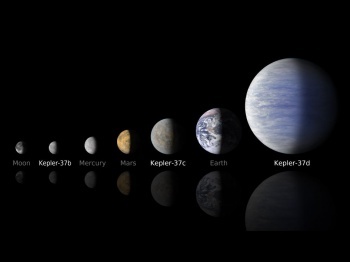 The planets were found as part of Kepler's mission to find planets in or near the habitable zone, but the Kepler system is very little like our own. Kepler-37's star is like our sun, but it's so close that the temperatures on its surface would be something like 800 degrees Fahrenheit - that's what NASA calls "hot enough to melt the zinc in a penny." Thomas Barclay, a Kepler scientist, said that "This discovery shows close-in planets can be smaller, as well as much larger, than planets orbiting our sun." All three of the Kepler-37 planets orbit closer to their sun than Mercury does to ours. Not too long ago, discovering exoplanets of this size was out of the question for NASA, but advances in techniques and equipment mean that NASA now knows Earth-size and smaller exoplanets are quite common. Kepler space telescope measures the brightness of more than 150,000 stars every 30 minutes, and identifies planets when one transits in front of the star and blocks light - the amount of brightness blocked reveals the size of the planet relative to its star. From there, scientists determine the size of the star by watching the boiling motion beneath its surface - oscillations which Kepler observes as a rapid flickering of the star's brightness. Kepler-37, with its high-frequency oscillations, is the smallest star yet analyzed.